Elliot Moore: Plastic. I’m talking to a plastic plant. I’m still doing it. Something the supposed contemporary auteur, M. Night Shyamalan, has never been quite good at is getting directly to the point. He usually likes to keep us guessing the whole way through and by the time the expected twist tries to catch us off guard, we are either completely floored or entirely annoyed. In his latest offering, THE HAPPENING, he finally learns how to get straight to the punch but that, as it turns out, is just as problematic as keeping us in suspense. Shyamalan seems as if he has been somewhat humbled by his recent difficulties finding an audience but from the moment his name appears ominously in the credits as the man who does everything (writing, producing and directing), his presence looms over the premise with an air of obnoxious knowing. THE HAPPENING first hits Central Park and we are given no time to breathe before the scenario turns apocalyptic. People stop in their tracks, repeat random phrases and find interesting or perhaps just easily accessible manners in which to kill themselves. No one knows what’s happening, except for Shyamalan, who appears to be reveling in the delirium from the rustling trees above. The affliction spreads and the mystery is at first certainly engrossing. Whatever intensity the scenario creates though is unnervingly undone by the cast’s delightfully laughable attempt at keeping it classical. Mark Wahlberg as enthusiastic hopeful, Elliot Moore, leads his wife and best friend (Zooey Deschanel and John Leguizamo) toward safety, despite having no idea where that is. His naïve optimism is cute when it should be compelling but he can hardly be blamed for what is clearly Shyamalan’s overall approach. The classical style and contemporary reality ultimately clash and it becomes clear that Shyamalan’s biggest obstacle is Shyamalan himself. His bigger ideas are solid but muddled by the little ideas he throws in to keep things interesting. Naturally, the tragic events are initially assessed to be terrorist attacks. Shyamalan paints America as a panic stricken populace that know who to blame when they cannot explain what is happening. They don’t even question the possibility of it being a more organic threat until too much damage has been done. This is in itself heavy enough to sustain intrigue while making smooth criticism of the American government as shepherd and its people as sheep, but when you meet the people he is criticizing, they are so futile, prattling on when they should be in crisis mode, you wish they would just breathe in the bloody toxins already and die. The promise of a more satisfying film always seems just out of reach and a little help behind the scenes, primarily in the writing department, would help Shyamalan find the focus he so desperately needs. 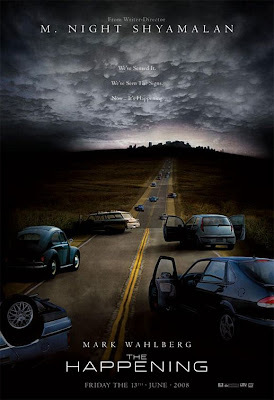 THE HAPPENING is passably suspenseful, occasionally intriguing but mostly ineffective. It feels contrived, as though Shyamalan were trying too hard to win back our graces, doing so in such a false fashion. Perched comfortably at his pulpit, he preaches about protecting the environment but without ever communicating any actual passion for it. Consequently, the pet cause feels more functional than it does pertinent. And all the while, you can feel him looking down at you, disappointed that we don’t get his genius when what he really should be doing is looking inward to see that perhaps he is just not communicating as clearly as he could. Then he might be able to see that we want to love him; he’s just making it too hard to do so.